If you are a dolphin aficionado and have ever dreamed of becoming a marine mammal trainer, this program was made for you! 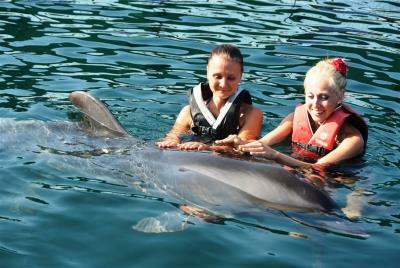 Work with our trainers during our Trainer for a Day program at our dolphin center in Marmaris. Discover what a day in the life of an animal trainer is really like. A rare opportunity like this doesn’t come along often, so don’t miss it. As a functioning participant of our team of marine mammal specialists, you'll have intimate interaction with the Pacific Bottlenose dolphins all day long-both in and out of the water. Not only will you take part in the Dolphin Encounter and Swim with Dolphin programs, you will be exposed to the important skills of caring for and training dolphins as you aid our trainers throughout the day in each facet of their job. The captivating work of marine professionals comes to life when you get to actively contribute to the daily tasks required in training and taking care of dolphins. We limit the spaces in our Trainer for a Day program to make certain that you have ample time and attention from our trainers and our dolphins. There are restrictions for fotos done by program participant or her/his accompanied person. Expecting mothers are restricted. For the safety of the swimmers, dolphins and trainers, participants are asked not to bring video or photography cameras to the wet areas during the interaction with the dolphins.